upcoming credits, though. Can Offerpal win? Offerpal is already in this business, indirectly: the service provides embedded “offers” in other web sites and online games. They act as reward-based advertising. For example, if you sign up to an “offer,” accepting the services of a different company perhaps, then you’ll be rewarded with virtual currency that can be spent in an online game. 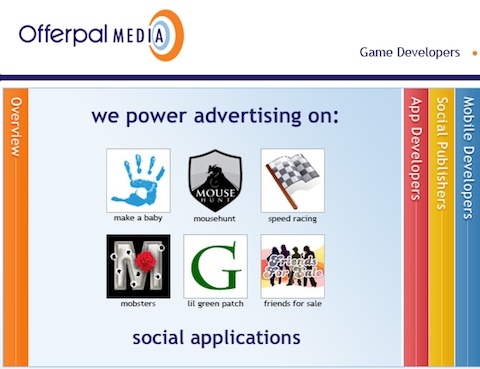 Offerpal is simply extending this system and adding in a central repository at GamePoints.com. This is a much bigger deal than it may seem, since it extends interoperability of the Game Points across Offerpal’s 1,500 advertising partners. The power of this system is that it moves beyond the confines of Facebook. That means it beats the Facebook Credits virtual currency, which is officially supported by Facebook’s own code framework but is limited to operating within the official and third party apps inside Facebook’s walled garden. In this sense, Game Points are more like a true currency, and Facebook credits are like Disney Dollars. The strength of Facebook Credits comes from the enormous success of Facebook itself, but Game Points already have buy-in from big Facebook app makers like Zynga. In other words Offerpal is setting itself up as a direct competitor to the Facebook machine. And with billions of dollars of real-world advertising money at stake, the competition is going to get fierce…and given Facebook’s brazenly cavalier attitude to its own revenue-generating users, seeing how it deals with a competitor like this is going to be fascinating.